I'm a glass half empty kind of guy. If the worst is going to happen, I'm expecting it. Mainly because if you lived in my shoes, you would realize is the norm and not the exception. So I have conditioned myself to always think the the absolute worst will happen. My logic is this: if you think the worse, and that is what occurs, you are prepared for it and can handle the crappy situation better. 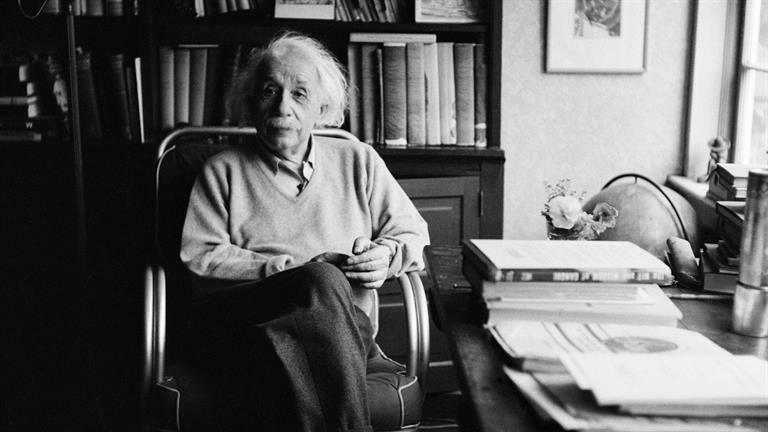 If something better, or even the best, happens, then the excitement is that much greater. Hey - it's my logic. My schooling helped me develop theories like that. The nice part about the other half of Wes' package is that you can count on some amazing things at the later stages. At least, in how I scan the cards. You saw the first part yesterday, and anyone that has ever received a mailing from Wes can attest that half of a JBF package is a hell of a great thing. But the glass overflows when you are done opening it. 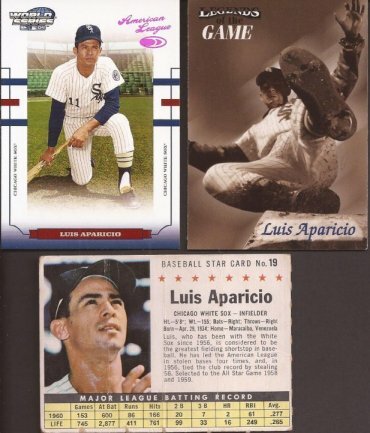 There were a few more serialed cards from Wes, but here are some of the most interesting, and low numbered. 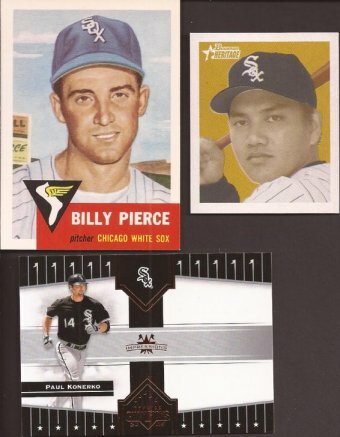 Going around the horn - Belle is /2500, Lyons is /399, Lee is /100, Thome is /149 and that Magglio is /50. How low can you go? Believe it or not, I never had that Pierce Archives reprint. Not sure how I have missed it all this time. I could have sworn I had it. I bet I find it the next big reorg I do. Bowman Heritage Iguchi makes 58 cards in that collection. Contenders Konerko bumps him up to 354. 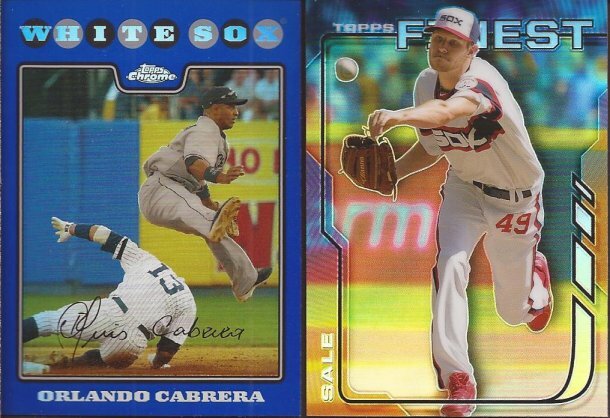 Two for the bimders - Cabrera into the double play and a refractor Sale into the throwback. 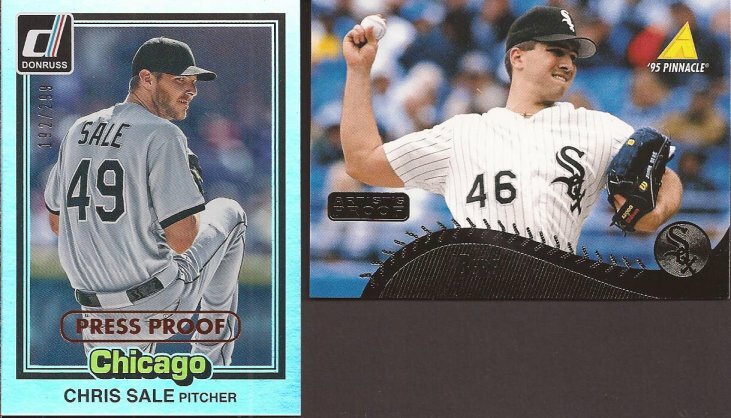 In reading some blogs today, I realized how few throwbacks cards are in series 1 this year. Someone said there will be an insert set in Opening Day. I hope so. Some nice uniforms need to be remembered on cardboard. Two Press Proofs. What in the hell do those really mean? I mean - sure - the Donruss on the left is some silly, stupid name Panini gave it to try and make the card cool and unique. But was the same true back in the 90's and the Pinnacle press proof on the Bere? 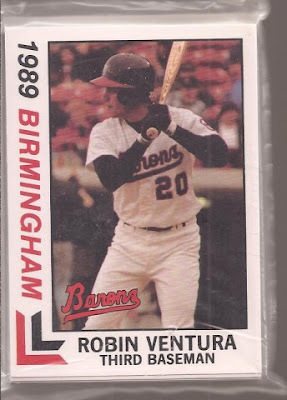 Wes included not only a Ventura minor league card, but the entire 1989 team set, still packaged. The only other names I recognize on the checklist are Don Wakamatsu, Craig Grebeck and Rich Amaral. There is a trainer card in here - I really want to rip it open to see what it looks like. But ebay comes to the rescue and tells me it is nothing special. 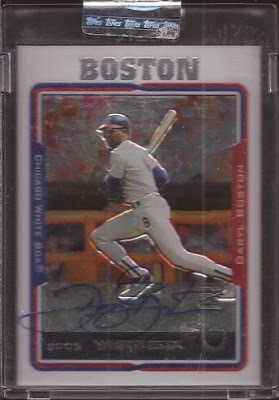 Last card, and the big highlight, is this encased Daryl Boston on card auto from 2005 Topps Retired set. Considering the shape of the snap down (scratched and scuffed), I rescued it and put it in my autograph binder. It looks much better freed to the world. Wes - #SuperTraders made a hell of a start at 2x3 Headquarters. Thanks a bunch as always. I hope I can make the White Sox proud in the group of nutballs. Unless the trainer looked like the guy who was with the Iowa Cubs in 1985, a wise decision. 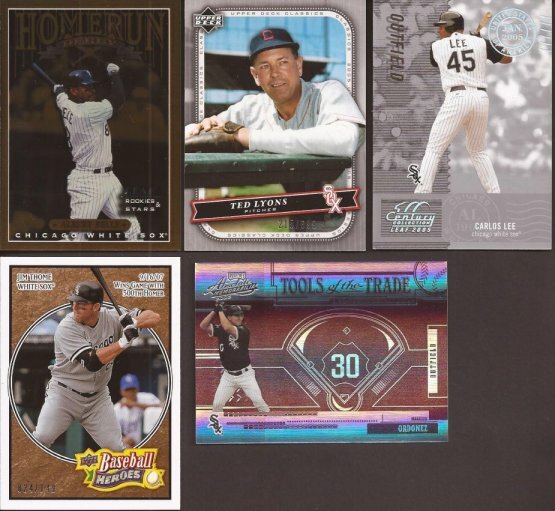 Nice bunch of Sox there, that Cabrera refractor is beautiful! I'm just like you Jeff, I anticipate the worst. So much so that I feel paranoid and very worried when everything goes smoothly and according to plan. Aparicio coming in cleats high! What a great shot! You are a Sale super collector now for sure. I'm always a positive person. It annoys my wife.